A Brazilian construction worker who injects himself with synthol, which is made up of 85% oil, 7.5% lidocaine and 7.5% alcohol, has vowed never to stop until he became the most feared monster in the street. A 48-year-old identified as Beefcake Valdir Segato, whose huge biceps measure a staggering 23 inches as a result of painful synthol injections, have doubled this size of his 12 inches arm after he began injecting the potentially lethal oil substance five years ago and now he wants to get even bigger. As a youth he was an emaciated skinny drug addict and lost so much weight he was known as ‘Skinny Dog’. ‘I got involved with drugs and I started losing weight because you don’t eat, you lead a wrong life,’ he said, adding that he quit drugs and joined a gym but he wanted more extreme effects than he could achieve from exercise alone. 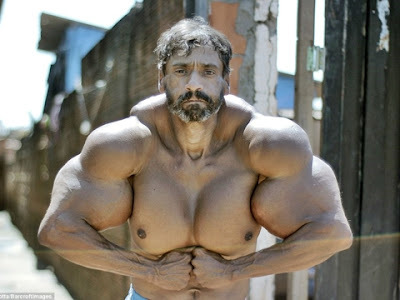 He was offered synthol by someone in the gym and, having an addictive personality, soon became hooked on the muscle-enhancing substance, which he injects into his biceps, chest and shoulders. He has bulked up from 55kg (eight stone, six pounds) to 80kg (12 stone, five pounds) but says the oil does not make him any stronger. Valdir Segato has been warned he could potentially face amputation of a limb if he continues to inject himself with synthol.